The South Pacific island nation of Fiji boasts many tropical plants among its native plants. However, much of Fiji's wild flora is endangered. From large palm trees to creeping lianas, Fiji's tropical plants constitute one of the main attractions for visitors. Some can be planted in subtropical areas in the United States to replicate the Fijian garden. Common derris (Derris trifoliata) is a liana, a woody plant that climbs through tree canopies. This plant has ornamental white flowers and is the only liana that grows on mangroves. Common derris contains a compound used in poison arrows. Its leaves contain rotenone, a chemical compound that kills fish, insects and other small creatures. Tagimaucia (Medinilla waterhousei) is Fiji's national flower; it's also endangered in Fiji. Another liana, tagimaucia grows along the mountainous slopes of Taveuni, one of Fiji's islands. Its flowers are white and crimson. While most lianas eventually smother the host plant, tagimaucia only uses it for support and does not harm the host plant. As Nature Fiji notes, tagimaucia flowers can be woven into garlands or leis to commemorate special occasions. Native to Fiji and other South Pacific islands, the Sago palm (Cycas revoluta) is endangered there; many palms have been harvested for their hearts. This slow-growing palm may take 50 years to reach a height of 15 feet. 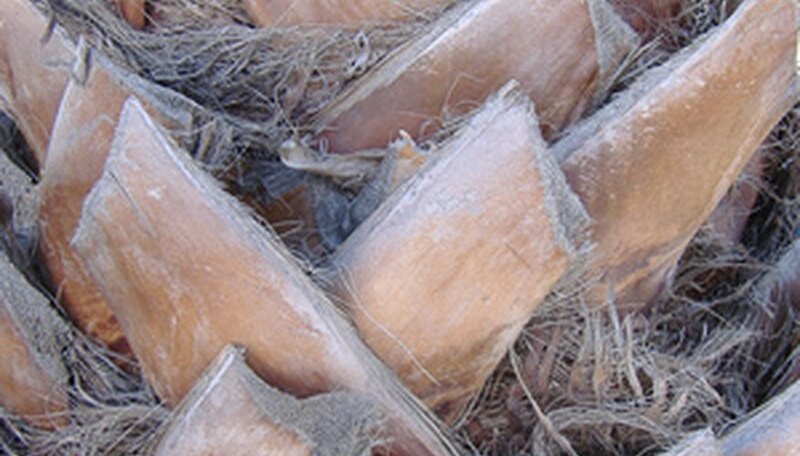 Sago palms have thatched trunks and long palm fronds with leaves that curl under. Commonly known as railroad vine or goat's foot vine, the beach morning glory (Ipomoea pes-caprae) is native to Fiji and grows along the coastline. This plant can trail up to 100 feet but never grows more than several inches high. Its flowers are dusty pink and its veined leaves are pale green.